Mio and her friends defeated the terrifying Nekomata, against every odds and now there was cause for celebration. But Mio is still connected to the Katana, still compelled to protect it, and the celebrations are cut short when it is discovered that the underworld has spawned a worse breek of monster to come after her. As London crumbles and the Kitsune go into hiding, Mio, Jack, Rachel and Shinobu need to find a way to stop these terrible creatures. Before its too late. 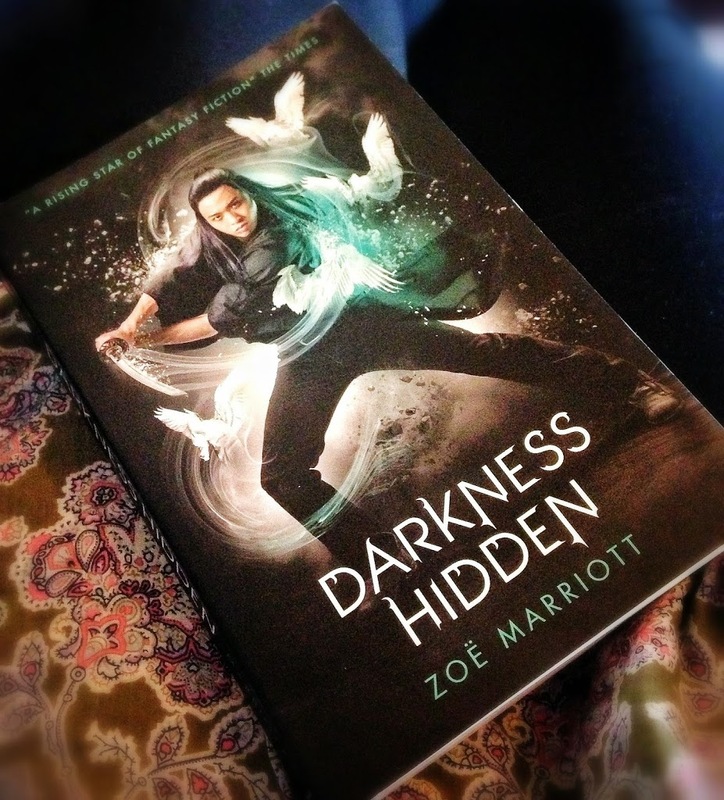 I have always loved Zoe Marriott from the minute I picked up my first book by her. She blends fantasy with a beautiful contemporary fantasy style which is both easy and beautiful to read and the second instalment of her first series, The Name of the Blade, has earned another tick on her backlist from me. First of all I have to give a major shout out to the ‘Previously in’ start to Darkness Hidden. Its been over a year since I read the first book in this series, The Night Itself, and as its currently being read by my big sister over 40 miles away I couldn’t exactly flick back to it for my own reference. The ‘previously in’ was just two pages so it was the very tip of everything that happened before the events of this book, but it was still very helpful.. thanks Zoe and Walker for that! I said in my review of the first book in this series that the characters were brilliantly developed and even though you don’t actually know them for very long time-wise, you feel like they are your friends and you know their true feelings. This book was even more impressive than the other when it came to that and I absolutely loved everything that went on between Rachel and Mio. The lack of Jack was noticeable for me though as she was probably my favourite character in the first book, but I still enjoyed sticking with the others. I really loved that this book answered a lot of the questions I had from the first about the background to the Katana and how the Yamato family came to be in possession of it. It wasn’t all revealed but it was definitely enough to stimulate me, without bogging the book down with information. There was one part of the story that I absolutely adored, however it happens towards the end and I don’t want to spoil anything for everyone. Knowing it happened in the book fills me with happiness though and it has made me even more excited for the next book. Again the book only takes place across a couple of days. I believe Mio was underground with the Kitsune for a few days but other than that the events right at the end of the book could only be a week at the most since those at the start of the first book. This is not a bad thing though and whilst the characters have to go through A LOT in that time nothing felt rushed and it all flowed really well. In this book and in the first you experience little asides where the focus goes from Mio to other characters and I loved it in Darkness Hidden because it really let you know how a certain other character was feeling and what they were going through. It also, again, took you back into past Japan and told you more about the Katana and Shinobu and I loved those bits as well. It took me a little while to actually get my head around the book at the beginning and I think thats because its been so long since I was in this world, so I don’t recommend that you go into this one over a year after reading The Night Itself, its definitely worth a re-read and you will benefit from it for sure. However saying that once I felt comfortable being back in Mio’s world I was in love once more and I think the wait for book three (which has an awesome name: Frail Mortal Heart) will be a killer. Darkness Hidden is the second in the ‘Name of the Blade’ series and was published on 3rd July by Walker Books. My copy was sent from the publisher in exchange for an honest review.